Simon agreed to terms Wednesday with the Patriots on a two-year contract, Ian Rapoport of NFL Network reports. Analysis: Simon was cut by the Colts ahead of last season but performed well upon landing a part-time role with the Patriots in late September. He played in 11 games in 2018, accumulating 17 tackles (eight solo) and two sacks. Look for the Ohio State product to again have a role in the Patriots' edge-rushing rotation while also logging snaps on special teams. Simon (shoulder) will suit up for Monday's game against the Bills. Analysis: Simon was not listed on the Patriots' injury report prior to kickoff, indicating that he was expected to be ready for the divisional affair. The Ohio State product has missed most of October, but he should regain his role as a depth outside linebacker moving forward. Simon (shoulder) was downgraded to out for Sunday's game at Chicago. Analysis: Simon was originally listed as questionable after being a limited participant at practice this week. The 28-year-old will miss his second straight game after suffering the shoulder injury against the Colts in Week 5. Simon (shoulder) is questionable for Sunday's game against the Bears. Analysis: Simon has not taken the field since suffering a shoulder injury in Week 5, and he was a limited participant in Friday's practice. The 28-year-old depth linebacker will return to a rotational defensive role when healthy, but it remains to be seen whether Simon will suit up against Chicago on Sunday. Simon (shoulder) is inactive for Sunday night's game against the Chiefs. Analysis: Simon was hurt in Week 5 and wasn't able to recover in time to take on the Chiefs despite the extra rest. The 28-year-old had seen 25 defensive snaps over his past two games and made six tackles (three solo) with a sack. 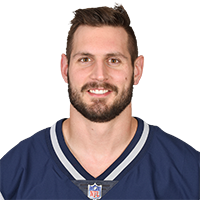 Simon is questionable to return to Thursday's game against the Colts with a shoulder injury, Mike Reiss of ESPN.com reports. Analysis: Simon's injury will hurt New England's depth at linebacker. Kyle Van Noy may be asked to fill in for Simon on special teams as long as he is out. 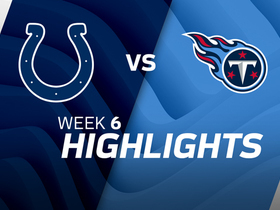 Simon recorded five tackles (two solo), including a sack, in Sunday's 38-7 win over Miami. 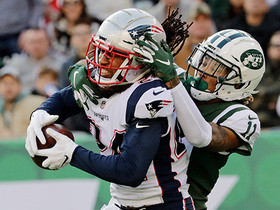 Analysis: Simon's stat line is impressive, especially considering he signed with New England last week and was only on the field for 20 defensive snaps. He saw some additional work after Elandon Roberts exited with an undisclosed injury. Simon could see more snaps against the Colts in Week 5 if Roberts is held out or limited. Simon signed a contract with the Patriots on Wednesday, Field Yates of ESPN reports. Analysis: Simon lands in New England after being released by Indianapolis in the beginning of the regular season. The veteran defensive end is expected to serve as a linebacker in the Patriots' defensive scheme, providing depth to the team with Ja'Whaun Bentley (undisclosed) having been placed on injured reserve. Simon will serve as a depth and special teams player. Simon was released by Indianapolis on Saturday, Ian Rapoport of NFL Network reports. Analysis: Simon hurt his neck last Sunday against the 49ers and was unable to play in the team's preseason finale, but there hasn't been any suggestion the injury is serious. The veteran defensive end was a surprise cut, considering he had 43 tackles and three sacks in nine games last season and was entering the second year of a three-year contract with the Colts. He shouldn't have too much trouble catching on with another team as a depth pass-rusher and special teams player. Simon's neck injury is not considered serious, but he won't play in Thursday's preseason finale in Cincinnati, the Indianapolis Star reports. Analysis: Simon left Saturday's game with a sore neck, but it sounds like the Colts were playing it safe. The injury may be a worry, however, considering Simon missed the final seven games of the 2017 season with a neck injury. Simon (neck) will not return to Saturday's game against the 49ers, Andrew Walker of the Colts' official site reports. Analysis: While the severity of this injury is yet to be confirmed, this simply isn't good news considering Simon missed the final seven games of the 2017 season with a neck injury. Simon (undisclosed) made one tackle, one sack and two quarterback hits during Monday's preseason game against the Ravens. Analysis: Simon is battling Jabaal Sheard, who has the edge in the pass-rushing department, for snaps at defensive end. However, Simon showed he can get to the quarterback -- he has 11.5 sacks over the last three years -- so the 27-year-old will earn additional playing time if he can build on that. Simon was sidelined for part of Sunday's practice due to cramps, Andrew Walker of the Colts' official site reports. Analysis: Simon's injury doesn't appear to be severe at the moment. The backup defensive end is coming off of a 1.5 sack effort in Thursday's preseason game against Seattle and will look to get back on the field in the near future. Simon had 1.5 sacks and three tackles in Thursday's preseason win at Seattle. Analysis: Simon had been bothered by a groin injury in training camp, but it doesn't look like a serious problem. Previously a linebacker, Simon was moved to a 4-3 defensive end position and his roster spot was believed to be in jeopardy, but his play Thursday made it seem as if he could earn a significant role again. Simon did not participate in Sunday's practice due to a groin injury, Andrew Walker of the Colts' official site reports. Analysis: There weren't any more specifics regarding Simon's injury, but there doesn't seem to be a whole lot of concern from the team. Simon is expected to be fighting for one of the final spots on the Colts roster during training camp, so he will want to get healthy and back on the field as soon as possible. Simon has moved to a 4-3 defensive end role in minicamp and hasn't received any starting reps, 1070 am Indianapolis reports. Analysis: Simon appears to be competing for a roster spot rather than a starting role, according to the report. The sixth-year pro had 43 tackles (28 solo) and one interception as a linebacker in 2017 while playing just nine games before a shoulder injury landed him on injured reserve. It sounds like he's not prominently in Indy's plans on defense unless he has a strong training camp. Simon (shoulder) will be moved from linebacker to defensive end in 2018, Greg Rakestraw of 1070 The Fan reports. Analysis: Simon ended the season on injured reserve, and he's working towards his new role now that he's healthy. The sixth-year pro had 43 tackles (28 solo) and one interception as a linebacker in 2017. Standing at 6-foot-1, Simon is shorter than traditional defensive ends, so it'll be interesting to see how he adjusts when the Colts shift from a 4-3 to a 3-4 scheme. Simon (shoulder) was placed on injured reserve Tuesday, Andrew Walker of the Colts' official site reports. 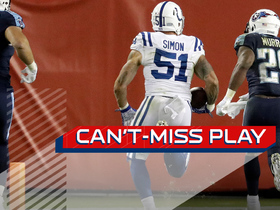 Analysis: Simon suffered the shoulder injury in Sunday's loss to the Jaguars. His season ends after nine games, in which he recorded 43 tackles (28 solo), three sacks and one interception which he returned for a touchdown. 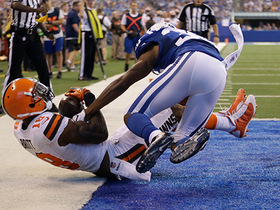 In his absence, look for Barkevious Mingo to take over starting responsibilities. Simon (neck) was a full participant in Wednesday's practice. Analysis: Simon has missed the past three games with a neck stinger. His full availability Wednesday puts him on a good track to return for this Sunday's matchup against the Titans. The Colts are hopeful that Simon (neck) will play Sunday against the Titans, Mike Wells of ESPN reports. Analysis: Simon has been sidelined suffering a neck injury in the Colts' Week 7 loss to the Jaguars. Barring any setback, he should resume his role as starting strongside linebacker. The Colts have officially ruled out Simon (neck) for Sunday's game against the Steelers. Analysis: Simon has been unable to practice since suffering a neck stinger in Week 7, so this decision is relatively unsurprising. In his absence, Barkevious Mingo figures to continue starting on the outside in an attempt replace Simon. Colts head coach Chuck Pagano said Simon (neck) won't practice Wednesday and is unlikely to play Sunday against the Steelers, Jason Spells of WTHR Channel 13 Indianapolis reports. Analysis: Simon hasn't practiced in any capacity since sustaining a stinger in Week 7. Barkevious Mingo will continue to start on the outside and aim to fill the edge-rushing void that Simon had provided. Simon (neck) was ruled out for Sunday's game in Houston. Analysis: Simon has yet to practice since sustaining a stinger in Week 7. Look for Barkevious Mingo -- who racked up nine tackles the past two weeks while filling in for Simon -- to pick up another start at outside linebacker Sunday. Head coach Chuck Pagano said Simon (neck) is "still down" with a stinger, Andrew Walker of the Colts' official site reports. Analysis: It isn't clear when Simon could return to the fold. Barkevious Mingo will likely continue to fill in at outside linebacker if he can't play Sunday against the Texans. 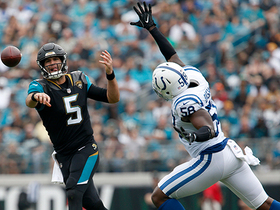 Indianapolis Colts linebacker Tarell Basham strips Jacksonville Jaguars quarterback Blake Bortles to force a field goal. 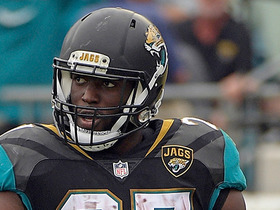 Jacksonville Jaguars running back Leonard Fournette gets shaken up on the play and limps off the field. Indianapolis Colts outside linebacker John Simon picks off Tenneessee Titans QB Marcus Mariota and takes it back for the TD. 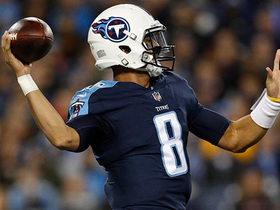 Tennessee Titans QB Marcus Mariota passes deep to wide receiver Eric Decker for 21 yards. 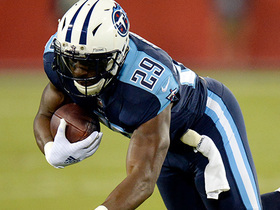 Tennessee Titans QB Marcus Mariota slings deep pass to running back DeMarco Murray. Cleveland Browns QB DeShone Kizer gets wide receiver Kenny Britt in the corner of the end zone for the 11-yard touchdown pass. 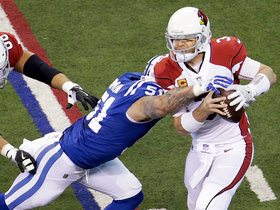 Indianapolis Colts linebacker John Simon sacks Arizona Cardinals quarterback Carson Palmer.